As Thanksgiving approaches, we think about all of the people and things in our lives that we are thankful for -- but how often do we think about being thankful for our economic good fortune? The 24-hour news cycle can make it seem like we are in a constant state of economic crisis. However, with some holiday perspective, we can see some of the more positive aspects of the US economy. Do you need some help getting into the optimistic mode? We are here to help. Consider the following bits of good economic news to put you in a thankful frame of mind. Shrinking deficit -- We may still be increasing our debt, but at least we are headed in the right direction by decreasing our deficits. The Congressional Budget Office reports that the budget deficit for fiscal 2015 was $435 billion. That is down from $483 billion in 2014, and well below the trillion-dollar deficits of 2009-2012. As much as the sequestration was ridiculed, it can take some credit for the decreasing deficit via throttling back government spending. Job growth -- According to data from the Bureau of Labor Statistics, the United States has reported a greater number of jobs every month since early 2010 -- 68 straight months of job growth in the private sector. Unemployment has reached 5 percent, the lowest it has been since February of 2008. It may be slow growth, but it is still growth, and that is certainly something to be thankful for if you have been unemployed at any time over the last few years. Low gas prices -- The oversupply of crude oil has sent gas prices plunging to levels not seen in years. As of this writing, the national average price for a gallon of gas is $2.20 and is predicted to dip all the way to $2.03 in December before rising slightly. Compare that to the average national gas price of $3.68 per gallon in 2012. Even better, prices are expected to stay relatively low at least through 2016 with a $2.38 per gallon average. Healthy stock market -- Stocks took a mid-year plunge resulting in a correction (a 10 percent loss in value), but the market has rebounded since then. It is back to the values at the beginning of the year with the Dow Jones Industrials near 18,000. For perspective, think back to Black Monday on October 19, 1987, when the Dow plunged 22.6 percent to reach a low mark of 1,738.70. Since then, the Dow has grown tenfold in value. You would have to go back almost four decades to find another tenfold increase in stock value. Low inflation -- Low oil prices played a large role in 2015's near-zero inflation rate, but the rate has been relatively low for a long time -- averaging close to 2.8 percent over the last 30 years. For a contrast, consider 1970-1982 when inflation averaged 7.7 percent and hit a peak of 14.8 percent in March 1980. Inflation eats away at your purchasing power over time, and forces you to earn even greater returns on your investments to meet your goals for savings and retirement. History tells us that all of these positive conditions will change at some point, so enjoy these economic upsides while we have them. It is easy to be a cynic and a pessimist about the overall economy, but why dwell on the downside? Join the glass-half-full club and you will find plenty of things to be thankful for, whether the subject is economic factors or other life situations. 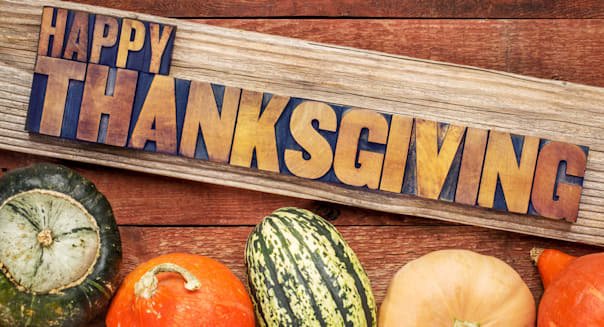 We at MoneyTips wish you all a Happy Thanksgiving.